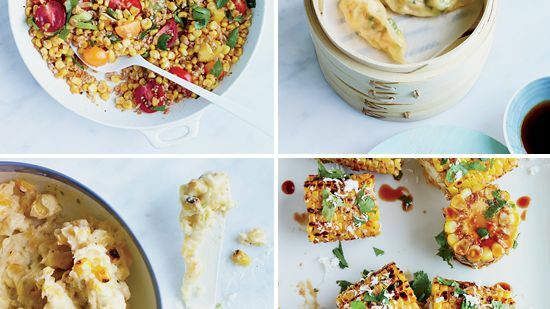 Fresh, sweet corn is the star of this set of easy recipes from F&W's Kay Chun. In a large skillet, heat 1/4 cup olive oil. Add 3 cups fresh corn kernels and 3 thinly sliced garlic cloves and cook over high heat until the corn is charred, 5 minutes. Scrape into a large bowl. Add 1 cup each of cooked bulgur, chopped tomatoes and chopped parsley. Add 1 tablespoon fresh lemon juice; season with salt and pepper. In a medium bowl, mix 1 cup fresh corn kernels with 1/2 pound chopped raw shrimp, 2 minced scallions and 2 teaspoons each of minced garlic and ginger; season with salt. Brush the edges of 20 small round gyoza wrappers with water and fill each with 1 tablespoon filling; fold and seal. Steam for 3 to 4 minutes and serve with soy sauce. In a cast-iron skillet, cook 1 ear shucked corn over high heat until charred in spots, 10 minutes; let cool. Cut the kernels off the cob and transfer to a bowl. Stir in 1 stick softened butter, 1/4 cup Parmesan cheese, 1 teaspoon grated lime zest and 1 tablespoon lime juice; season with salt and pepper; serve with grilled fish. In a small saucepan, cook 1/2 cup unsweetened coconut milk with 1/4 cup soy sauce, 2 tablespoons light brown sugar and 1 tablespoon each of fish sauce and lime juice until syrupy, 10 minutes. Light a grill. Grill 4 ears shucked corn, turning, for 15 minutes; brush with the glaze for the last 5 minutes. Sprinkle with chopped cilantro and grated Cotija cheese and serve with lime wedges.